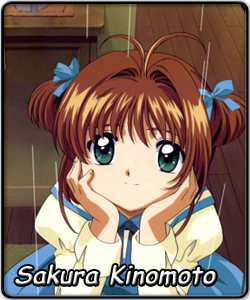 Sakura Kinomoto is an energetic, ordinary elementary school girl with an annoying brother Toya and a crush on his friend Yukito. At the age of ten, she had a daunting quest thrust upon her. One day after school, she accidentally opened a sealed book of powerful magical cards and scattered them around town. Deceitfully persuaded into a contract by their guardian Kero, Sakura began the hunt to seal these Clow Cards, with extra help from her very close friend Tomoyo Daidouji. If she doesn't, then a disaster will befall upon the world. Without knowing exactly what this disaster will be, Sakura will have to take on this extra job. At first, she fought grudgingly and reluctantly, scared of the tasks to come. This all changed when a card came very close to hurting the things she loves, which led her to accept her responsibility fully. Uniquely among magical girls, Sakura gets a different outfit for each fight, courtesy of Tomoyo. The cards have different personalities; some let themselves be captured without a fight after they've had fun, while others demand proof of Sakura's competence before submitting. She was faced with many challenges as she confronted them all with courage, even when contesting with a rival, male lead Syaoran Li, for the cards. However, when all the cards are captured, what else awaits Sakura? Who is this mysterious Yue and what is the meaning of the dream she has been having for such a long time? As Sakura's adventures continued, she embarked on a brand new journey, meeting a mysterious new rival. It was clear that while the cards changed her destiny, they affected her daily life as well. As she entered fifth grade, it was obvious how the cards created a new path for Sakura in friendship and romance. New friends came along with her adventures, such as the kind Mizuki-sensei, the new transfer student, Eriol-kun, and of course, Syaoran's cousin, Meiling, who is just as energetic as Sakura. Little did she know that one of her close friends has a crush on her, but Sakura never had a good sense of awareness, so unfortunately, it went by unnoticed. With many more challenges at hand, how will Sakura solve all of them? Sakura always gives her best to the task at hand, sometimes too much, causing her to dangerously tire herself out. She is a kind "iiko" (good girl) whom people just can't bring themselves to hate, even when a peculiar love triangle is on the line. Sakura was around in the early days when Saimoé was merely a small moé contest on Japan's 2channel forum. Back then, she flew through her competition and finished as the victorious winner after defeating Ayumu "Osaka" Kasuga in the finals. Since then, Saimoé became a huge tournament with various anime-viewers gaining interest so much that Saimoé has become an international phenomenon. Although Sakura probably will never be able to enter Japan and Korea's tournaments again, news of a new International Saimoé League reached her, and she came to the preliminaries to prove that she can run with the new girls. Now after finishing 8th in the preliminaries, Sakura will be fighting hard to win her second Saimoé championship... and her second tiara.